In the 1970s, Yugoslavia emerged as a dynamic environment forconceptual and performance art. At the same time, it pursued its ownform of political economy of socialist self-management. Alienation Effectsargues that a deep relationship existed between the democratizationof the arts and industrial democracy, resulting in a culture difficult toclassify. 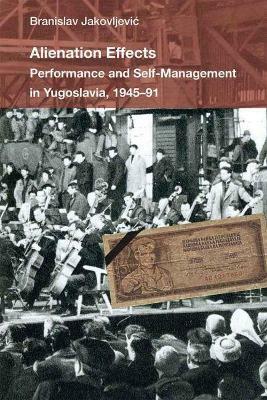 The book challenges the assumption that the art emergingin Eastern Europe before 1989 was either "official" or "dissident" art,and shows that the break up of Yugoslavia was not a result of "ancienthatreds" among its peoples but instead came from the distortion anddefeat of the idea of self-management. The case studies include mass performances organized during stateholidays; proto-performance art, such as the 1954 production ofWaiting for Godot in a former concentration camp in Belgrade; studentdemonstrations in 1968; and body art pieces by Gina Pane, Joseph Beuys,Marina Abramovic, and others. Alienation Effects sheds new light on thework of well-known artists and scholars, including early experimentalpoetry by Slavoj Zizek, as well as performance and conceptual artists thatdeserve wider, international attention. Branislav Jakovljevi? is Associate Professor in the Department of Theaterand Performance Studies at Stanford University, USA.